On December 6, 1968, Brothers Doris Eugene Fletcher and Dan Foster Miller attended a meeting at Grand Lodge. The meeting was arranged to learn the proper procedures for forming a new lodge in the Springdale community. Most Worshipful Brother H. Dwight McAlister, Past Grand Master and Grand Secretary and Most Worshipful Brother Henry F. Collins, Past Grand Master and Past Grand Secretary informed the brethren of the necessary steps including having a Past Master appointed as Master of the lodge under dispensation. Brother Fletcher approached Worshipful Brother John Billie Mackey, Past Master of Sinclair Lodge No. 154, A∴F∴M∴ who agreed to accept the appointment of Master of the lodge under dispensation. Worshipful Brother Mackey and Brother Fletcher called an organizational meeting of all Master Masons in good standing from the Springdale area. Twenty-two brethren attended the meeting on December 8, 1968, including Most Worshipful Brother Collins, who explained to the gathering the requirements for forming a new lodge. Eighteen brethren signed the petition to start the lodge at that meeting. Again, with the assistance of Most Worshipful Brother Collins, the "Petition to the Grand Master for a Dispensation to Open and Hold a Lodge" was completed on January 19, 1969, and forwarded to the Grand Master. The petition included the following recommendations: Worshipful Brother John Billie Mackey as Worshipful Master, George Edwin Barton, Jr. as Senior Warden and Doris Eugene Fletcher, Jr. as Junior Warden. Fifty-three brethren were listed on the petition. Brother Grier L. Taylor, the secretary of Cayce Lodge No. 384, A∴F∴M∴, being the nearest lodge, certified the approval of the new lodge while its Worshipful Master, Worshipful Brother Thomas E. Rivers, certified that the selected meeting place was secure and suitable for Masonic purposes. The District Deputy Grand Master of the Eighth Masonic District, Right Worshipful Brother Eland F. Harris and his committee, consisting of Worshipful Brother Michael E. Cooper, Worshipful Master of Sinclair Lodge No. 154, A∴F∴M∴ and Worshipful Brother A. Hugh Eargle, Past Master, verified that the three warrant officers had been examined on January 25, 1969, and certified that they were thoroughly conversant with the ritual of the three degrees and the constitution of the Grand Lodge of South Carolina. 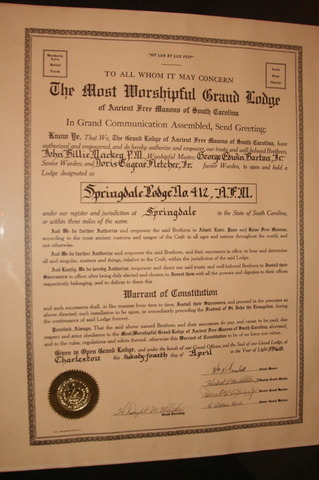 The Grand Master, Most Worshipful Brother William H. Grimball issued a dispensation on February 3, 1969 to Springdale Lodge, U.D. and recommended that the warrant officers be appointed and the lodge begin work. The dispensation was presented to the lodge by Right Worshipful Brother Harris on February 7, 1969. That same night the first petition for degrees was accepted from Vincent Rhodes, Jr. The first degree was conferred on the evening of March 14, 1969. Brother George E. Barton, Jr., Senior Warden, served as Worshipful Master pro tem. At the two hundred thirty-second annual communication of the Grand Lodge of Ancient Free Masons, held in Charleston, South Carolina from April 24-25, 1969, a charter was granted to Springdale Lodge No. 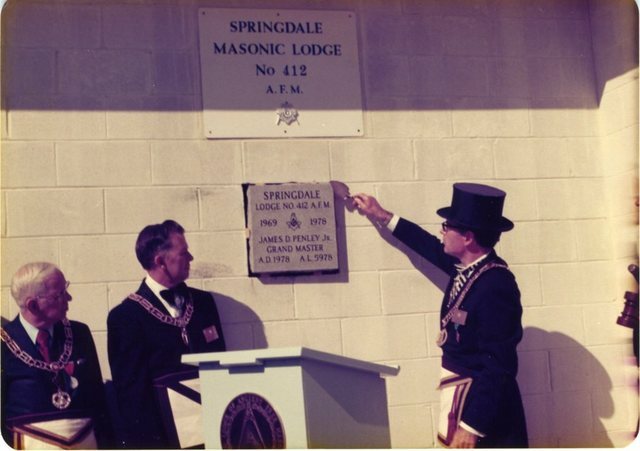 412, A∴F∴M∴ Most Worshipful Brother Grimball attended Springdale Lodge No. 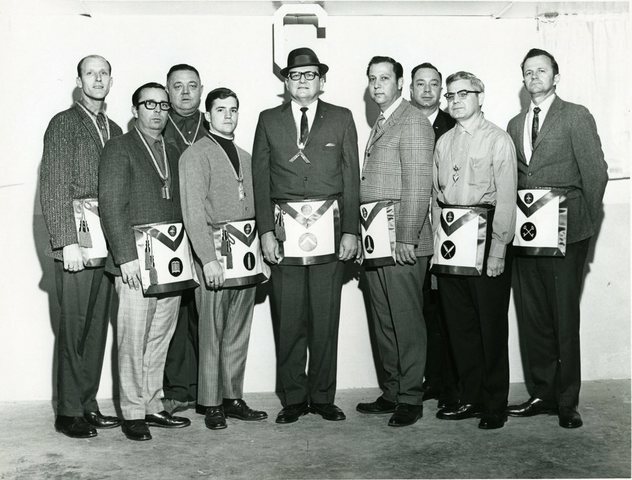 412, A∴F∴M∴ on May 24, 1969, at Cayce Lodge No. 384, A∴F∴M∴ for the purpose of consecrating, dedicating and constituting the new lodge and installing its officers. The third reading of the proposed by-laws took place on September 5, 1969. They were approved and forwarded to Grand Lodge for its approval. The first election of officers was held on December 5, 1969. These resulted in George E. Barton, Jr. as Worshipful Master, Willie E. Floyd as Senior Warden, Larry T. Gay as Junior Warden, Jack L. Royal as Treasurer and Lester H. Liles as Secretary. Springdale Lodge No. 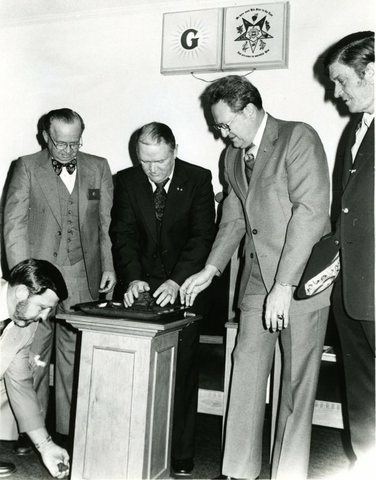 412, A∴F∴M∴ met in various locations prior the acquisition of property including: the basement of Airport Baptist Church, Springdale City Hall, the old airport terminal, Cayce and Sinclair Lodge buildings. After many months of searching, a motion was made on March 2, 1971, to purchase the current property on Springdale Road. The debt was paid off on February 2, 1972. A motion passed on July 6, 1973, to begin construction of the lodge building. The water connection was made on September 7. 1973. An adjacent strip of land was purchased and, after much planning, the lodge building was started on July 2, 1976. The plans called for a one-story building which was ready for its roof on October 1, 1976. A special dispensation was requested and received from Grand Lodge on February 19, 1977, to borrow $20,000 to finish the building. 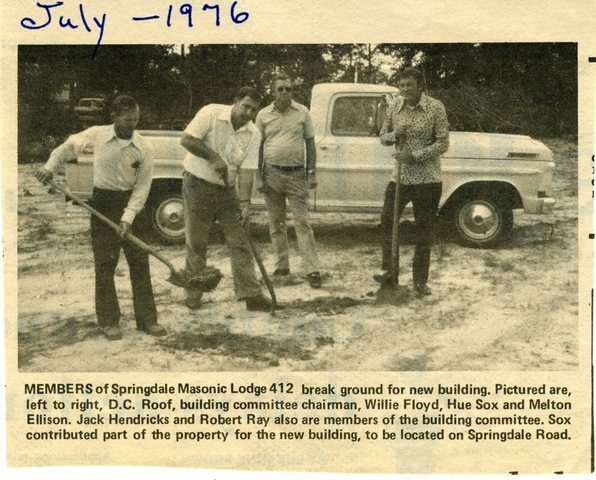 The first meeting in the new building, a Master Mason's degree, was held on November 25, 1977. A motion passed on December 6, 1977, to sponsor a chapter of the Order of Eastern Star. Most Worshipful Brother James D. Penley, Jr., opened Grand Lodge on February 11, 1978, to lay the cornerstone and dedicate the new building. Most Worshipful Brother James B. McGuirt presided over mortgage burning ceremonies on March 29, 1980. Land behind the lodge was purchased on May 3, 1983. Classrooms were added to the rear of the building on April 3, 1984, to provide privacy for coaching candidates.